ATOM received its North American premiere at Montreal’s MUTEK in May. That turned out to be perfect programming, as it placed ATOM in a week that featured complementary work from artists Artificiel. Henke says some of his matrix manipulations – and even the specific Max/MSP patches from ATOM – came from collaboration with Artificiel and their light bulbs. For their part, at MUTEK they unveiled a new audiovisual etude called POWEr Play involving a live-sampled Tesla Coil. The science fair ethos of ATOM and POWEr Play could have been gimmicky or overly fixated on spectacle, but in these pieces, it was anything but. Both works contemplated their subject matter so thoughtfully that balloons and electrical coils seemed perfectly natural media for the audiovisual imagination, and audiences were left marveling at phenomena in a way too rare in 2009. It’s worth downloading the video above and really getting to soak up some of this piece when you have time. I also have an audio interview of a conversation with Robert and Christoph immediately following one of the performances. You’ll hear Christoph’s voice first, followed by the unmistakable percussive enthusiasm of Robert. 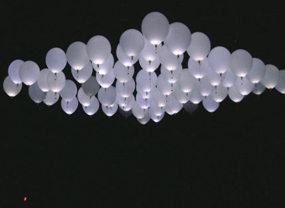 For me, the best part of the interview was hearing them discuss whether you should notice some of the unintentional randomness of drifting balloons or technical hiccups, and how they structured the work formally with a palette of possible balloon patterns.